This is part 2 of a short series sharing my gluten-free experiment. Yesterday I reflected more on the existential angle of things; today I’m going to tell you a bit more about the experiment itself and what has come of it so far. As I said, my reason for considering going gluten free was the information that new research was suggesting that “mild” celiac (without uncomfortable digestive symptoms) had been implicated in repeated miscarriage. After hearing my friend’s take, I started doing my own research. The whole “mild celiac” thing is somewhat controversial, but I started hearing about and reading doctors talking about minor thyroid problems being linked generally to auto-immune disorders and gluten sensitivity. In turn, a nutritionist Jared and I had respected for ages, Marilyn Shannon, had long ago linked low progesterone with mild, untestable thyroid problems, the evidence for which was low basal body temperatures. Haven taken my temps every morning as part of natural family planning, I knew they were chronically very, very low, but my thyroid always tested fine, so I didn’t know what to do with that information. Now I had a candidate: low progesterone caused by an only-slightly-screwy thyroid, caused (or at least exacerbated) by some form of gluten sensitivity. My kitchen helper, who has discovered quite the taste for GF bread. 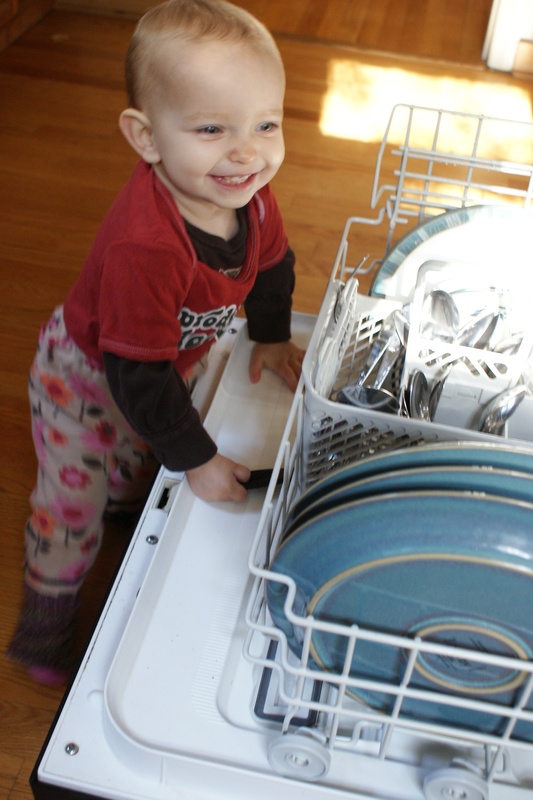 Her main job in the kitchen is putting silverware in the dishwasher, which she will happily do, though usually not until after she’s taken everything else out first. The first thing that happened, to my surprise, was the my psoriasis cleared up. According to the National Psoriasis Foundation, psoriasis has not been definitively linked to gluten intolerance, but many people have reported improvement of their symptoms on a GF diet. Psoriasis runs in my family, and I had gotten a very nasty and annoying case of it on my palms during the last quarter of 2013. I hadn’t gotten around to seeing a doctor about it, but I’d seen psoriasis enough times to know precisely what it was. But within a few weeks of going GF, it cleared up completely. The second thing that happened – try not to hate me – was I lost a bunch more weight. I had already been shedding an average of 3-4 lbs/month since Naomi was born, and was about 10 lbs shy of pre-pregnancy weight when I went GF. I was very pleased with this achievement, considering that I had gained at least 60 during that pregnancy, and had long-ago decided to love my new body and not try to achieve any standard of skinniness. So when I went GF I didn’t make any particular attempt to count calories or anything; I just tried to maintain the modestly healthy habits I had been developing: my overeating was generally under control, and I exercised maybe 15 minutes walking 2-3x a week while carrying a baby on my back. But after my first two months of going GF, I had lost another 20 lbs. I still remember the week my metabolism kicked over; I kept getting hungry right after big meals. My body was telling me, eat more now! You are still feeding a child with food your body makes! I think my weight has more or less stabilized; I intentionally do not own a scale. Now, this weight loss might be mostly because gluten-freedom (or, as I like to call it, gluten liberation) means, for me, going off most sugary foods – simply because I am too cheap to buy expensive replacements! But I wasn’t religious about it; I ate my share of Debbie Bliss GF box brownies. Still, this diet also meant going off a large percentage of carbs. But I still eat a lot of grains and legumes, as well as a lot of diary and nuts, and I do not shy away from animal fat. So the jury’s still out on whether this weight loss has anything to do with going GF, or whether it’s just evidence that the whole low-carb high-fat diet thing has something to it. (I was always suspicious of “no fat” yogurt.) I suspect both are true. The third thing that happened was that all my random joint pain went away. I had assumed my achy creakyness was a consequence of pregnancy weight, but that didn’t explain why it still hung around after I’d lost the first 50 lbs. I just chalked it up to getting older and having a crappy couch. But within a few weeks of going GF, all my joint pain was gone. This could also be attributed to the weight loss, but joint pain is a symptom of gluten sensitivity. Darn you, confounding variables! The fourth thing that happened was that sloooowly… incrementally… slightly… my basal body temperature went up. Only by an average of three tenths of a degree, and still well below what would be considered normal for a healthy thyroid, but a non-negligible difference. It turns out the measure I thought would be most objective was the least incontrovertible! My period did finally come back, not as often as would be considered “normal,” but more often than it had been for me for years before. All these factors sound significant, but I wouldn’t call them conclusive. So it’s time to take the experiment to the next level. More on that tomorrow. WOW!! All those positives surely have made this GF diet worth it!! I’ve been really proud of you and pleased for you. I’m anxious to hear about the progress of your new experiment. Keep writing! Kathy, thank you for sharing! I wouldn’t have thought of “cutting out all the whites” as a thing, though I do try to do that generally speaking. That is a neat goal. I’m so glad you’ve experienced improved health!